On my recent trip to Spain, I got to eat at the world famous Asador Etxebarri (Anthony Bourdain’s best meal of his life – and mine now too) in the middle of Basque country in Spain. Home of the world’s Grill Master Victor Arguinzoniz, he’s known for cooking with fire over coals and wood, and pairing different foods with the correct type of coal or wood that suits it best. He even makes his own coal. And the 7-course tasting menu was indeed out of this world! But one more thing that impressed me was the very accessible wine list. The prices were really reasonable (less than some of the food! ), making it easy to order a bottle – not a glass – of local white to go with the many varied seafood dishes and a bottle of Rioja red (made mostly from the Tempranillo grape) to go with the meatier ones. Since lunch would be a 4-hour affair, we had time to take the wine all in. The white we ordered was a local grape called Txakolina shown above, from Itsas Mendi which means “sea and mountain” in Basque. The Basque make Txakolina in flat and sparkling varieties, and drink it with everyday meals in their homes. This flat Txakolina was lively, a bit lemony and briny. It’s made from a local grape called Hondarrabi Zuri, grown and bottled overlooking the bay near Bilbao. A bit wild and windy, perfect for the Grill Master’s typical meals and seafood dishes. 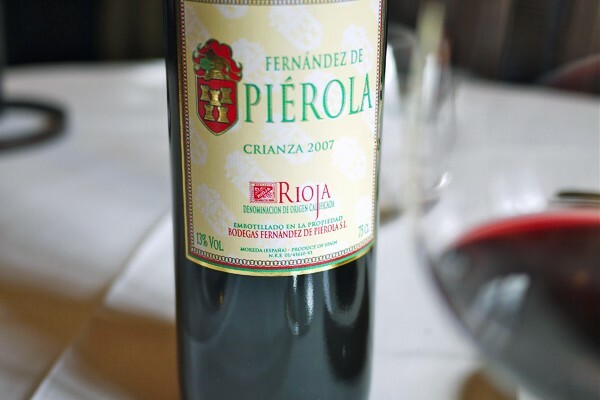 For the meat dishes, we chose an affordable Rioja 2007 Crianza from Fernández de Piérola. La Rioja is just an hour’s drive or so from here, and remains the locals’ wine of choice for nicer bottles with dinner. What I love about Rioja wine is how the laws about grape quality and specific requirements for time in barrel and in bottle assure the drinker of how the wine will taste. I love the youthfulness of Crianza over Riserva and Gran Riserva for pairing with various meat dishes – it’s a pretty versatile wine. This wine was elegant in the background of the food’s main stage, complementing without being too brash. Wines were perfect and food was plentiful in our day of eating at Etxebarri. Now all we had left to do was nap.